An exceptionally bright supernova discovered last month appears to shine brighter than 500 billion Suns. That’s twice as luminous as the previous record—but because it’s low in hydrogen, scientists are confused as to where this exploding star got all its energy. As Nature News reports, superluminous supernova ASASSN-15lh was first detected on June 14 by the All Sky Automated Survey for SuperNovae in Cerro Tololo, Chile. The discovery was confirmed earlier this month by astronomers from the Kavli Institute for Astronomy and Astrophysics at Peking University. Superluminous supernovae have been discovered before, but this one’s particularly bright—about 2.5 times more luminous than any seen before. The light from the exploding star, which was detected approximately nine days after its peak brightness, took approximately 2.8 billion years to reach Earth. Located in southern skies, it can’t be seen by the naked eye, but it should be visible by telescope or binoculars. 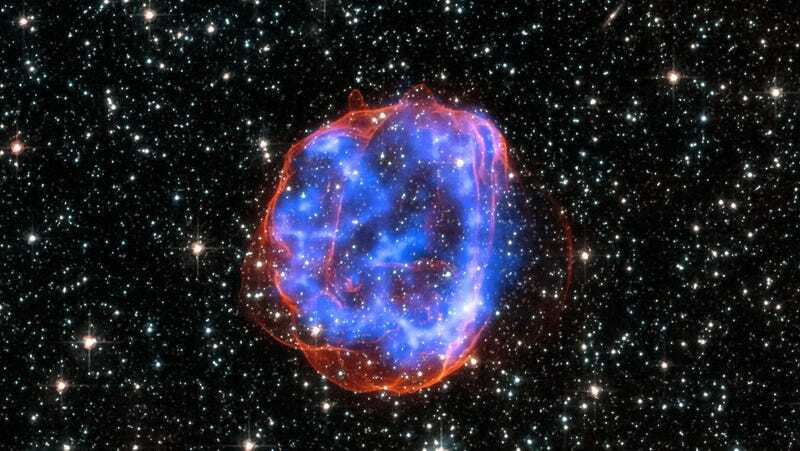 One hypothesis is that low-hydrogen supernovae are powered by magnetars: extremely magnetized, rapidly-spinning neutron stars left behind by the supernova explosion, says Edo Berger, who researches superluminous supernovae at Harvard University. But other astronomers, such as Avishay Gal-Yam who studies supernova at the Weizmann Institute of Science in Israel, say the supernova is releasing so much energy that even a magnetar might not be powerful enough to produce it. Another possibility is that that its output is fed by the energy released from matter spiraling into a black hole. Also perplexing is that ASASSN-15lh’s apparent host galaxy appears itself to be very massive and luminous. Until now, superluminous supernovae like ASASSN-15lh have been found within dwarf galaxies, which are relatively small and dim with meagre stores of elements heavier than hydrogen and helium. Astronomers think that these environments help stars keep up the high rotation rates they need to become magnetars. Looking ahead, the researchers are hoping to locate the supernova within its galaxy and monitor its fading brightness over the coming months. This should help them learn more about this extraordinary object. Read the entire study at the pre-print arXiv: “ASASSN-15lh: The Most Luminous Supernova Ever Discovered”. Contact the author at george@io9.com and @dvorsky. Top image by NASA/CXC/Rutgers/J.Hughes; Optical: NASA/STScI.